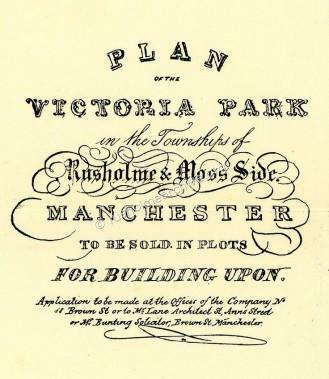 "The formation of an extensive Park"
The design of the undertaking, now submitted to the public, is the formation of an extensive Park, in the immediate neighbourhood of the great and increasing town of Manchester, and the erection within that Park of an adequate number of first-rate dwelling houses. The want of private residences of this description is, perhaps, sufficiently notorious, from the extreme difficulty which has been experienced meeting with them; a difficulty which, when coupled with the circumstance, that a very considerable number of the inhabitants must abandon their present abodes, in consequence of the rapid conversion of dwelling houses into warehouses, will at once evince the desirableness and importance of the proposed measure. Nor can it be doubted, that a large and beautiful tract of Land, skilfully laid out for the erection of handsome villas; protected from every nuisance, and each residence so placed as to command an advantageous prospect, without interfering with those around it, will furnish an object of great ornament and interest; and, looking to the income arising both from the houses to be erected on it at a cost which the undertaking will greatly reduce in each particular case, and from such portions of it as may be sold off on chief rents, will prove a very safe and profitable investment for capital. With the view now stated, a very appropriate site has been secured, in a most fashionable and improving situation, extending from the Didsbury to the Stockport Road, and about two miles from the Manchester Exchange. The land has naturally a park-like appearance, and possesses advantages for the intended purpose, perhaps not equalled by any other. Among these may be enumerated its contiguity to the best roads leading from that part of the town to which the principal business is rapidly removing; the variety of means of access to it; its total freedom from manufactures of every kind, and from any of their disagreeable effects; and the accommodation which will be presented by a new and elegant church, on the point of erection, either in the park, or immediately on its verge. The principle of Tontines, upon which it has been determined to proceed, is one which has been often and extensively adopted in various parts of the kingdom, and offers inducements totally different from any of the numerous projects before the public. Taken in conjunction with the well understood and appreciated systems of life-insurance, no scheme can be devised so certain to preserve the capital embarked in it, and entirely free from all possible risk. It will appear from the conditions subsequently stated, that each shareholder will have the appointment of one nominee for every £100 subscribed: and, during the life of such nominee, will be entitled to an equal proportion of the annual profits of the estate; and that such shareholder, or his representatives, will not only have the chance of becoming entitled to one-fiftieth, or even more, of the whole property, but, by insuring the lives of his nominees, will receive back the whole of his subscription; and, by similar insurances from time to time, may protect the increased value of his shares, occasioned by the falling off of the other nominees of other individuals, thus taking from the under-taking that speculative character attaching to many of the projects now before the public. The expense of insurance will be so trifling, as to render it almost certain that, in the course of a very short time, the income arising from that share will pay that expense, in addition to a handsome interest. The plan, thus considered, offers a mode of provision for children, infinitely superior to any other. The amount of subscription for each share, upon which a high interest will be receivable during the continuance of the life of the nominee, and which may be insured, as before stated, will secure a much greater and more certain result than can be effected by any other means, besides which, it should be remembered that, even without an insurance, there is a fair probability that, although the lives should fall before the division of the estate, the sum subscribed will be amply reimbursed by the largeness of the annual dividends. For example, - if a parent of six young children, uniting the advantages of life- insurance with those of the Tontine, should take up one share for each child, he might, by the yearly payment of less than £1 a share, secure to himself on the death of the last survivor of such children, the whole amount of his subscription. It is quite needless to point out the advantages which the shareholders who shall have selected any of the fifty surviving nominees, will realise, or the great addition to the value of the existing shares which must necessarily be experience annually. It is sufficient, simply to advert to the rapid and signal improvement, which the formation of the park must at once occasion, and to the gradual rise in the price of land in this neighbourhood, - a price which, notwithstanding its late increase, is yet not one-third that of land similarly situated near Liverpool and other large towns. The holders of shares in respect of which an income of ten pounds is derivable, will be entitled to VOTE FOR THE COUNTY. The tontine is to consist of 7500 shares of £100 each. The interest of the shareholders is to depend upon the lives of nominees, to be named by them, on or before the first day of October next. One life may to be nominated for each share, or for any number of shares, at the option of the shareholder; and, during the life of the nominee, the shareholder nominating, his heirs or assigns, is to be entitled to a proportion of the rents, profits, and other advantages, arising from the estate, corresponding with the number of his existing shares. On the death of a nominee, all rights, estate, and interest whatever attaching to such life, and to the shareholder having nominated the same, shall immediately merge in the funds of the company, thereby increasing the annual income of the other shareholders, and consequently the funds of the company, thereby increasing the annual income of the other shareholders, and consequently the value of the shares. When the number of the nominees shall be reduced to fifty, the shareholders, their heirs or assigns, who shall have selected such fifty surviving nominees, will become the absolute owners of the estate. The estate shall be vested in three persons, to be nominated by the directors, as trustees for the shareholders; and all vacancies, by death or otherwise, shall be supplied at a general meeting. 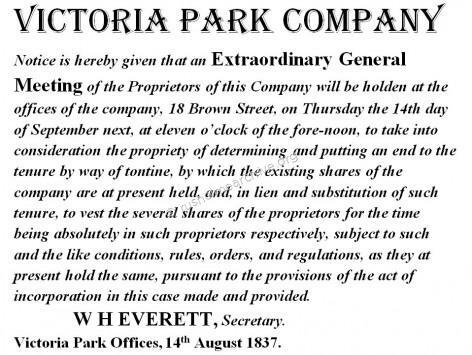 The whole management of the tontine shall be vested in a committee of five shareholders (not being trustees), to be called “The Directors of the Victoria Park Tontine,” who shall be appointed at a general meeting of shareholders, to be convened by the provisional committee, and who shall have power to enter into all contracts for purchase or sale, to make bye-laws, and such other rules and regulations as they make think necessary for the interest of the company. The directors shall choose a secretary, to be responsible to, and be removed by them. An annual general meeting of the shareholders shall be held in the month of July, at which the business of the company shall be transacted; but special general meetings may be called at any time by the secretary, on the requisition of three directors, or of twenty shareholders. Each shareholder shall have a vote at every general meeting, for every ten shares held by him or her. The number of shares to be holden by any one person shall be limited. Each shareholder shall pay a deposit of £5. 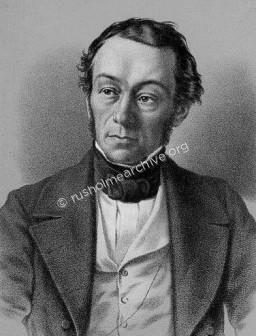 Per share, on allotment, into the bank of Messrs Daintry, Ryle & Co; or into the Northern and Central Bank of England; at the same time producing a certificate of his having signed the declaration of association; together with such further calls, not exceeding £10. per share, at any one time, nor without two months previous notice, as the directors may require. That the shares of those persons who shall neglect or refuse to pay any call or calls, within the time prescribed, shall be forfeited, and shall become part of the general stock of the company. That shareholders shall have the preference, according to priority of application, of purchasing such sites in the park as may be laid out for selling upon chief rent, at the price fixed by the directors. That every shareholder who shall transfer his shares to such person or persons as shall be approved of by the directors, shall thenceforth cease to be liable to any further responsibility to the company. 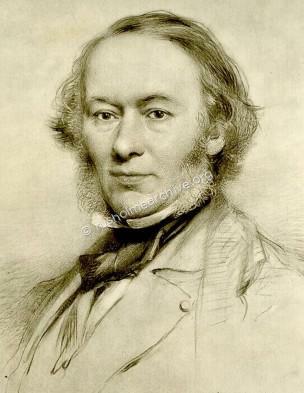 The images above are of Richard Cobden, a Liberal statesman and resident of Victoria Park. 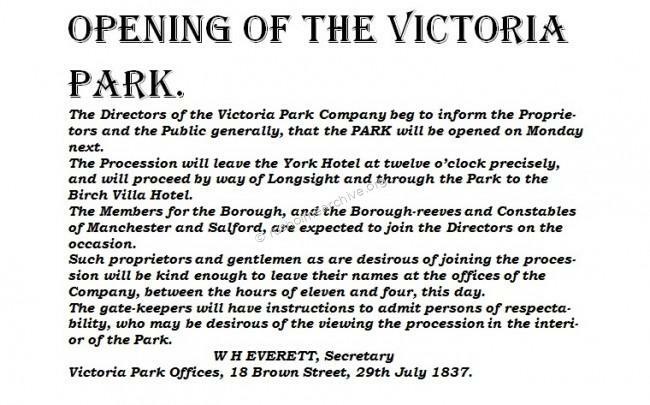 The Park was evidently well advanced by July 31st, 1837, for on that day a formal opening took place and this was a grand affair. It is well and picturesquely reported in Wheeler's Chronicle of Saturday, August 5th. “A procession of thirteen carriages was formed at the York Hotel. 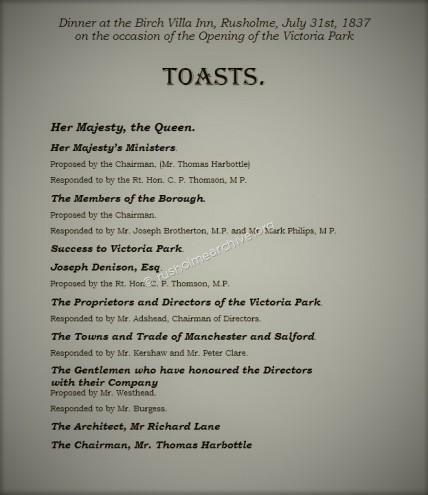 In these were, among others, the recently returned Members of Parliament for Manchester. The Cortege proceeded to the handsome Entrance Lodge at Longsight and was there met by a band which, amid the acclamations of a considerable assembly, performed the National Anthem in superb style. The account in Wheelers Chronicle goes on to state that nine mansions were already complete or nearly so and that draining and soughing of several miles had already been done. There is mention, too, in it of ornamental plantations and a note that, in a twelve month, a comparative wilderness had been converted to a promising public undertaking. 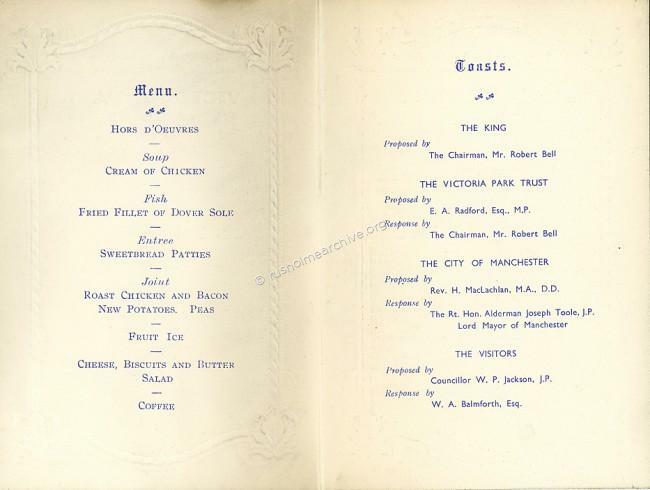 “After the procession had passed out of the Park by the Rusholme gate, an elegant cold collation at the Birch Villa Inn was partaken of by fifty people". 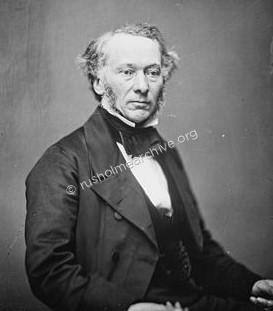 Thomas Harbottle Esquire was in the Chair; Joseph Westhead & Richard Lane filled the Vice-Chair. The local Members of Parliament, the Rt. Hon. C. P. Thomson (later Lord Sydenham), Joseph Brotherton and Mark Philips were present. There were very many speeches and ten formal toasts. It seems that every one interested was toasted in turn. In the toast of "The Towns and Trade of Manchester and Salford," Peter Clare stated that the Park was free from the atmospheric objection so common in Manchester, namely its smoke. After the dinner the procession formed up and went through the Park again, passing out of the new Entrance in Oxford Place. The reporter notes that, "in all the proceedings there was no single untoward event to mar the retrospect of this most harmonious and gratifying ceremonial”. 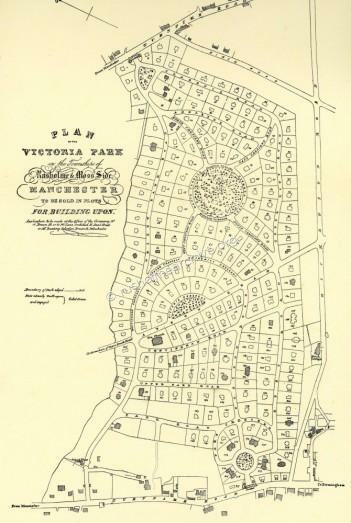 “The Victoria Park, which is one of the most interesting places in the vicinity of Manchester, is situated about two miles from the town, in the townships of Rusholme, Moss Side, and Chorlton-upon- Medlock, and is comprised within a ring fence, which extends from the London road on the north, to the Oxford or Rusholme road on the south. 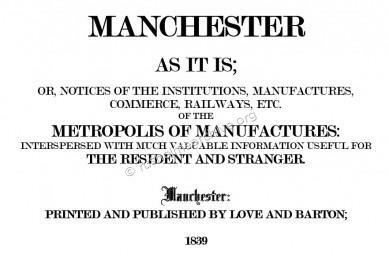 It contains 140 acres of land, and is the property of a company of gentlemen chiefly resident in Manchester and the neighbourhood, who are incorporated by an Act of Parliament (5th William IV.) The objects of the proprietors are to erect villa houses, at rents varying from £100 to £250 per annum, free from any possible nuisances that in other situations may arise from the vicinity of smoke and manufactures; and to combine, with the advantage of a close proximity to the town, the privacy and advantage of a country residence, which, in the rapid conversion of all the former private residences of the town into warehouses, has long been deemed to be a desideratum. There are at present about fifty gentlemen’s seats, either occupied or in progress of erection, in this park, as well as a church, which is intended to contain twelve hundred sittings. This building, which is to be of stone, and in the pure style of Gothic architecture, will be, when completed, a very handsome edifice; and placed as it is, exactly opposite the termination of Upper Brook-street, will become alike conspicuous and ornamental to the whole of its neighbourhood. There are in the park five miles of roads, laid out in crescents, terraces, &c., with ornamental plantations on either side; so that a few years will produce a beautiful effect, and afford many attractions which have been hitherto unknown to Manchester. 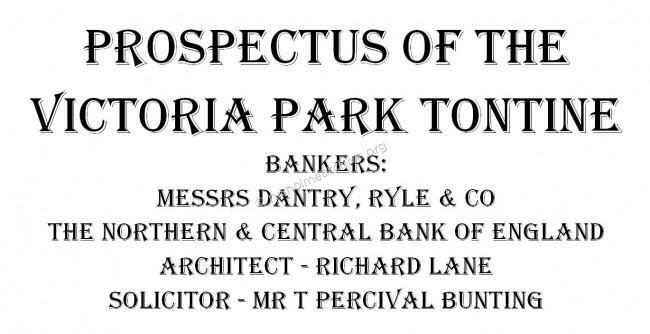 After this “splendid undertaking” had got off the ground with the grand opening one might have thought that Victoria Park would soon realise the potential envisaged by the original Directors and the shareholders would sit back to reap generous dividends, rentals and large capital gains. Not all was well however; although there had been an initial flush of building, notably a number of houses by the architect Richard Lane (and a director of the company), the reality was that too much land had been bought speculatively at too high a price, there were not enough subscribers for the available share capital, (£500,000) and most damagingly to the scheme, the cotton industry in Manchester had just slipped into a period of depression. From this notice it seems to be quite clear that the rather rosy and optimistic future of the Tontine based prospectus was not going to work – presumably there had not been enough subscribers. The Centenary History referred to above is a very useful book that was presumably printed for private circulation amongst the Victoria Park residents. Although the book, (cover above), has no reference to an author there is plenty of evidence that it was written by Earnest Bosdin-Leech who was then the Secretary of the Victoria Park Trust Committee. 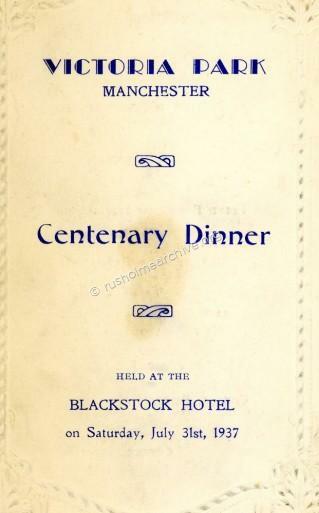 On Saturday July 31st 1937 a Centenary Dinner was held at the Blackstock Hotel to celebrate the first hundred years of the opening of the Park. Below is the menu, (rather stained! 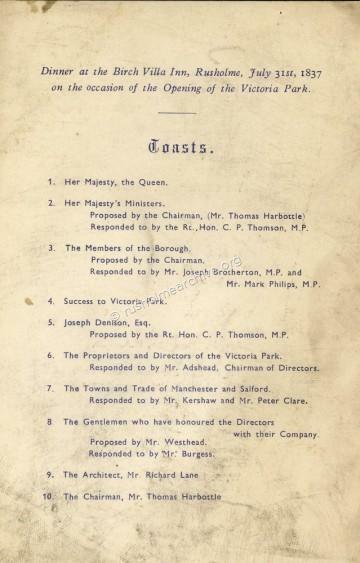 ), the front cover first, followed by the centre page, and then, the back page, which is a memoir of the ten toasts at the formal opening of the Park in 1837. Earnest Bosdin-Leech died in 1950 so the 1937 book is still subject to copyright for another 7 years. As his two daughters, Anne & Pauline Leech have now died the copyright is the property of their niece who has very kindly agreed that the book can now be available on rusholmearchive.org as a PDF download. 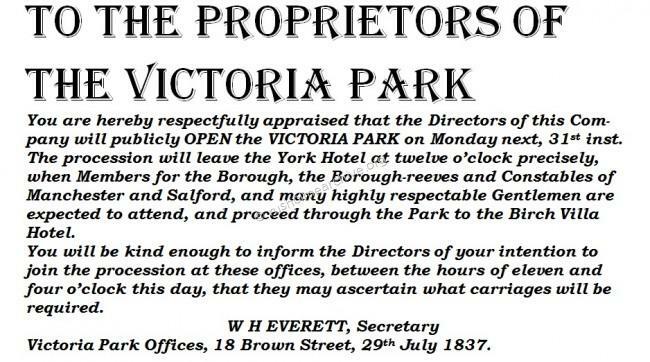 This book is essential reading to follow the development of Victoria Park. Provided you have Adobe software installed you can easily download the file and save for future reference. 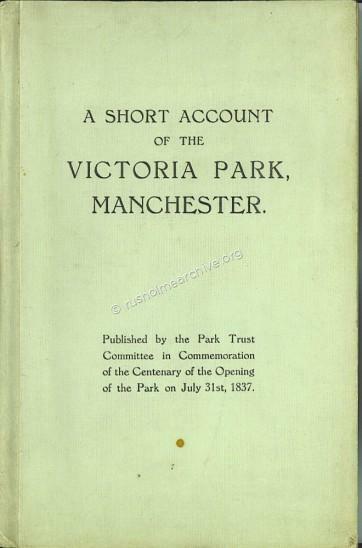 Although this book covers the first century of Victoria Park as a private park, it was only a few years later in 1954 that Manchester City Council absorbed the park, taking responsibility for roads, pavements and sewerage. In April 1954 the gates that ensured tolls were paid & protected the Park were taken down and Victoria Park officially ceased to be private estate. 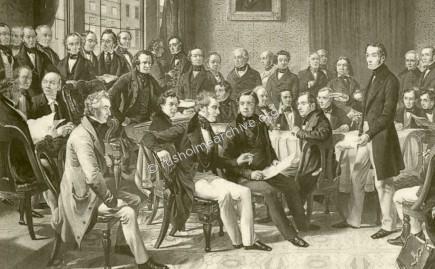 One notable omission from the book is any account of the trial of the founding directors, solicitor, secretary and architect in 1842. It still considered to be an important part of English Law and is often quoted, ‘Foss V Harbottle 1842’. There will be an opportunity to read about this a little further down the page courtesy of Wikipedia. Click below to download the PDF version of the 1937 Victoria Park Centenary History. 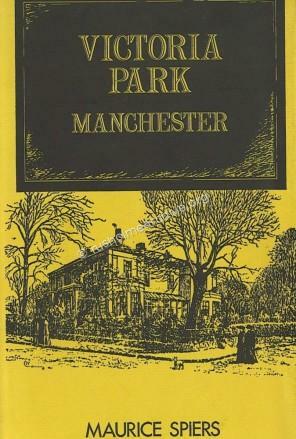 Another book that is a significant contribution to the history of Victoria Park was published in 1976. 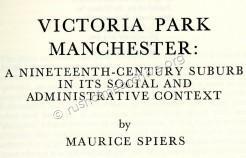 The author, Maurice Spiers, started the work as a university thesis which eventually was published for the Chetham Society by the Manchester University Press. Although out of print copies occasionally appear on E-bay, try searching the ABE book exchange, (http://www.abebooks.co.uk) where there is often a copy, also some public & university libraries hold copies.I have reproduced the cover below & trust the publishers will not object. 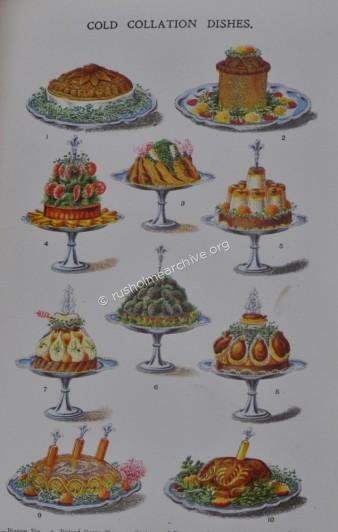 I have been intending for some time since starting rusholmearchive.org to create a comprehensive page about Victoria Park - this is just a start and I will be returning from time to time to load more material. I will leave with a splendid architectural drawing of Regent House on Upper Park Road, the architect being Edward Walters. 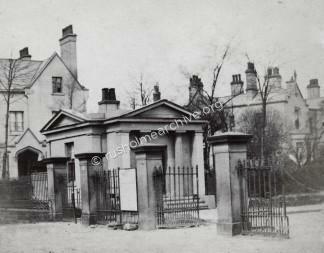 The villas were built in 1854 and demolished in the 1970's. 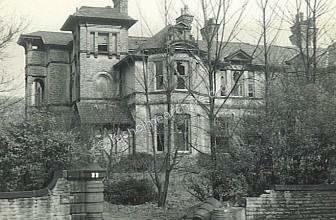 The very sad state of the Villa beneath prior to demolition approx 1971, Photo courtesy of Peter Helm. The next page is a study of Langdale, the home of Edward Langworthy; he lived in Victoria Park for some 35 years. Click here for Langdale, the home of Edward Langworthy.